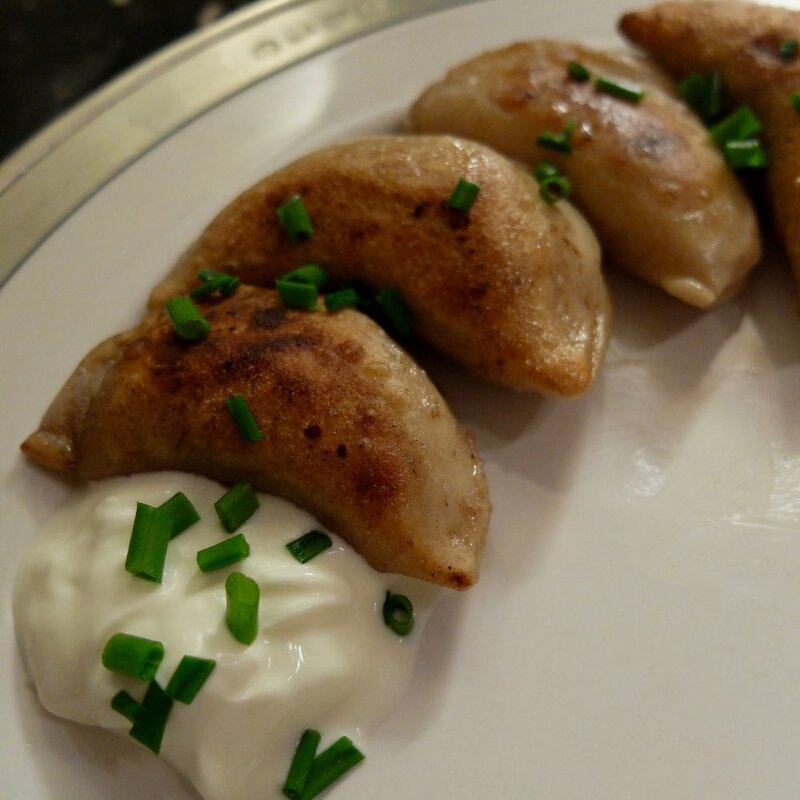 I grew up eating pierogis* occasionally- my mom would buy frozen ones and saute them in butter, then serve them with sour cream for a quick weeknight meal. I'm pretty sure she ate hers with cooked onions on the side, but as we've discussed, I didn't touch onions with a barge pole until I was probably 20, so I definitely ate mine without them. As I grew up, I realised that pierogis are not as common in American households as I previously thought- admittedly, it's been four years since I shopped in an American supermarket, but I don't recall ever having even seen pierogis in a grocery store, and prior to this week I think the last time I had them was probably in high school when my mom made them for me. When I found a recipe in the Box for homemade pierogi, I set it aside thinking it would be a pain, and probably it required a pasta maker, and I didn't think I was up to the task. Fast forward to this month, when outside it's so cold that all I want to do is stay in the kitchen because it's the warmest place in the house and make warm, cosy food, and... suddenly the idea of spending a frozen Saturday locked in the kitchen with only flour, mashed potatoes and a rolling pin to keep me company sounded magical, so that's how I spent last weekend. 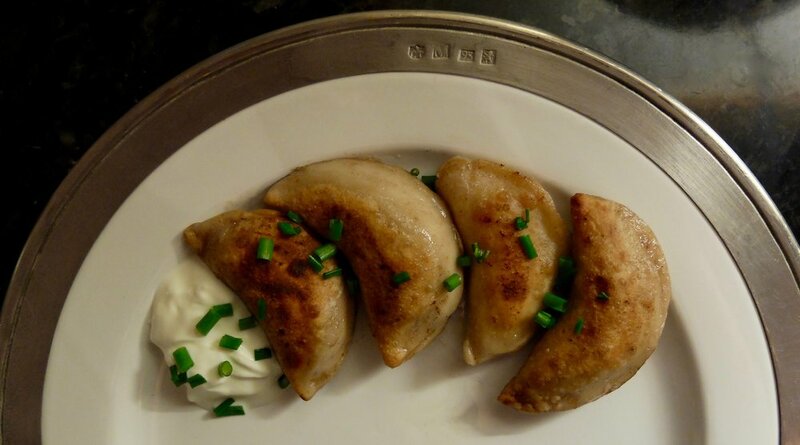 If you're not familiar with pierogis, they're Central/Eastern European dumplings (most likely originating in Poland, though it seems every country in the region has claim to their own version), generally made from a simple dough and filled with potatoes, sauerkraut, onions, mushrooms, cheese, fruit or any combination of the above. They're nearly impossible to make in small batches, so this is a dish to make when you want to stock your freezer, have a dinner party and/or stock a friend's freezer while you're at it. Vegetarian and made with budget ingredients, these are perfect for making in January, when everyone's resolutions involve eating less meat and spending less money. Now, the logistics: these aren't easy per se, but they're far simpler than I thought they'd be. You need a substantial amount of time to make them on account of making the filling and rolling out the (fairly stiff) dough, but it's actually simple to get the dough as thin as you need it to be, the dough adheres to itself easily so you don't need to worry about the pierogi coming apart as you go, and once you get into a rhythm, it's really not difficult. Also, there's no real 'technique' involved as there is with, say, macarons or soufflés where you don't know until you remove them from the oven whether they have worked or not. With pierogis, you can taste the filling in advance and re-season as needed, I've included specific instructions for the texture and thickness of the dough to take the guesswork out, and when you're finished, you fry them in butter which covers all manner of sins. If you're looking for a way to fill your freezer, get creative in the kitchen and try out a food you probably have never made from scratch before, here's your chance: get yourself an audio book (I listened to like half of Paula Hawkins' newest while making these), a podcast you're really into or a Netflix series that jumps straight from one episode to the next and spend your day in the kitchen rolling and filling these delicious dumplings. You might really enjoy it! It helps to make your filling a day ahead, so that on the day you can just focus on dough making, rolling and filling. Fillings can be anything I listed above, or anything else you can think of. I made half of my filling according to the recipe below, and for the other half I made a simple mashed potato mixture with sauteed shallots (I happened to have some shallots on the edge), sage, rosemary and a scoop of cottage cheese. They were amazing. If you make a mashed potato filling, you'll want the mashed potatoes to be substantially drier than you would normally eat them. They should be mashed until there are no potato lumps, but resist the urge to add more milk/butter/cream cheese/whatever you usually use to make yours smooth. When the dumplings are cooked, the steam softens the potato mixture and if you make them too smooth to begin with, they'll be runny by the end. Keep any dough you aren't rolling out covered with a warm, damp dishtowel to keep it from drying out. If it does start to get too dry, you can add a few drops of water and rework it briefly, but be careful not too add too much so that the dough becomes sticky. ROLL ROLL ROLL that dough until it's as thin as possible. 1/16-inch is ideal and though that seems impossible, if you work in small-ish quantities of dough (1/5 or so of total dough at a time), it's totally doable because this dough does not stick to the counter or your rolling pin. Next time I am dying to try a sweet filling- prune is traditional, and I might use the prune purée from this recipe next time to see how it goes. *For what it's worth, the plural is pierogi, and the singular is pierόg in Polish, but since most English speakers refer to them as pierogi and pierogis, I'm going with that. 5 spoons out of five. These are beyond delicious, I had a blast making them, and I'm pretty excited that there are 60 more dumplings in my freezer just waiting to be reheated and eaten when the weather gets too cold for anything but potatoes. Peel, chop coarsely and boil the potatoes in enough water to cover them until tender. Drain the potatoes, then return to the pot, turn the heat back on low, and begin mashing (this helps rid the potatoes of the steam trapped in the pot). Mash for 1-2 minutes until steam begins to lessen. Add cheddar and cottage cheese and continue mashing until smooth (as mentioned above, consistency should be drier than normal mashed potatoes as the pierogi-cooking process will moisten the filling and make it smoother). Taste and add salt & pepper accordingly, remembering that finished pierogis will have salt in the dough and be sauteed in salted butter, so don't overdo it on the salt- just enough to keep filling from being bland. Set filling aside (may be refrigerated overnight until ready to use). With a mixer, combine flour, salt, and egg until well mixed. Drizzle in the water a few spoonfuls at a time, watching for dough to become 'dough-like,' pulling away from the edges of the bowl and forming a ball. THIS HAPPENS QUICKLY so add water very slowly. If dough still has not formed after adding the ½ c, add more water by tablespoonful, mixing on low speed all the while. Dough should be VERY stiff and firm but still able to be rolled, and should not stick to countertops, rolling pin, etc. Fill a small bowl with water and place it next to your work surface. In batches (unless you have arms like Michelle Obama), roll dough out to 1/16th-inch thickness, keeping remaining dough covered with a warm damp kitchen towel to keep it from drying out while you work. Use a 3-inch round biscuit cutter to cut circles from dough, then fill them with a small scoop of filling in the centre. If your dough is quite stiff, as it should be, it won't want to seal on its own, so dip your finger in the bowl of water and run it around the edge of the circle to help the dough form a seal. Fold circles in half over the filling and press edges together, making sure to press air out as you go (works best to start sealing in the middle of your half-circle and work your way to the edges). Set filled pierogis on a baking sheet and keep on going. To boil, drop pierogis into enough boiling water to cover them and boil 3 minutes. Drain and serve as below. To fry (as I prefer and as illustrated here), melt a few tablespoons of butter in a pan, then drop a few pierogis into the pan (do not crowd the pierogis). When the first side is browned, flip the pierogis and cook the second side until golden. Sprinkle with chives, additional butter or sour cream and flaky salt or black pepper. 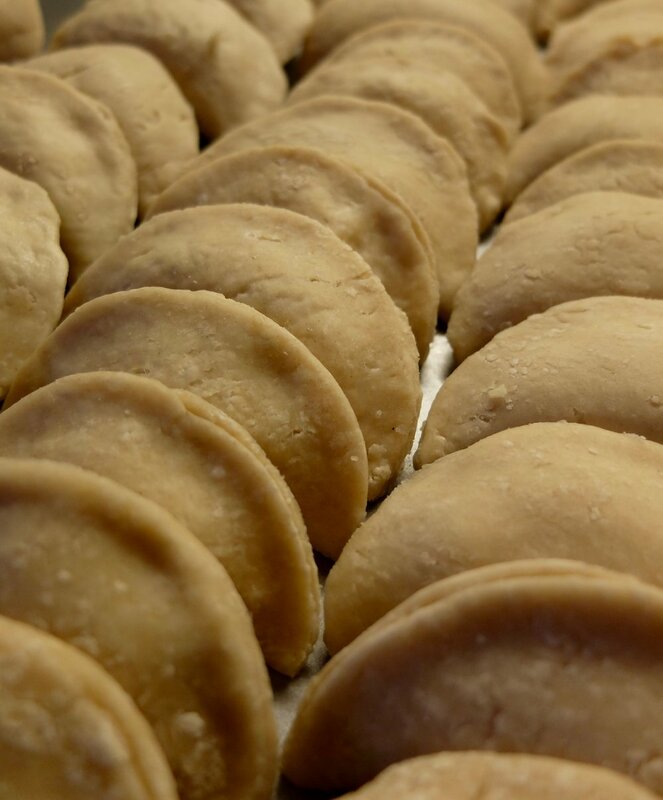 To freeze, place uncooked pierogis on a baking sheet and place in freezer for fifteen minutes. Remove from baking sheet, place in a tightly sealed bag and freeze. Pierogis may be thawed before cooking or cooked from frozen by allowing a few extra minutes of cooking time. Yields 75 pierogis, plus additional filling in case you manage to fit more filling inside than I did.